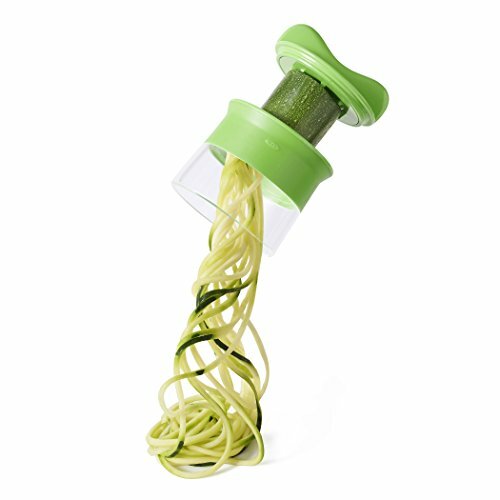 The OXO Good Grips Handheld Spiralizer creates curly noodles from zucchinis, cucumbers and other long vegetables for pasta-like dishes, salads and garnishes. The open-blade design also accommodates round vegetables like potatoes and beets for curly fries, frittatas and more. The included food holder keeps hands safe and helps to use all of the vegetable, minimizing waste. The Good Grips Spiralizer is BPA free and features green accents. When you're finished, clean it in the dishwasher and use the food holder as a cap for safe storage.